One more farmer lost his life on the altar of SEZ development in Polepally ! Polepally team traveled across the state to interact with people fighting against Special Economic Zones, displacements. We interacted with groups in Kakinada SEZ, Krishnapatnam SEZ, Eruru, few others SEZs in Nellore and Polavaram dam displaced adivasis in Bhadrachalam. 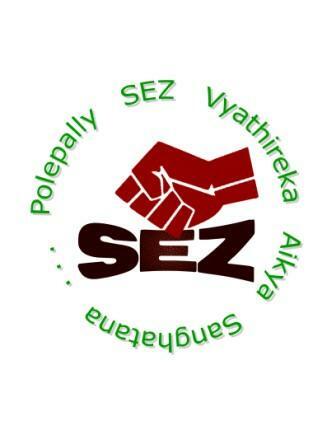 We are asking seeking the support of all anti-SEZ groups to the Polepally struggle. We need to mobilize all anti-SEZ forces against the state government that is possessed by SEZ madness. Let us unitedly oppose the coastal corridor which destroys the livelihood of thousands of Fishermen, Daliths, Ryots, and Coolies and at the same time smashing the production of food grains, sea foods, and thus adversely affects the lives of the poor people. This Government is not caring for the public opinion and the opposition of the Fishermen, Dalits, Farmers, and Coolies, artisans. We oppose the issue of G.O. No. 34 against the people’s aspiration and giving consent for formation of coastal corridor and we the Committee against formation of Industrial Coastal Corridor oppose it tooth and nail. How the rulers and officials did give shape to this coastal corridor which is anti-people? The Govt. which came into power on the basis of big promises of the welfare of the poor people and claiming to be the harbingers of Indira Raj , is pushing the life of poor people to extinction through S.E.Zs, Pharma Parks, Chemical Industries, and Industrial Parks. 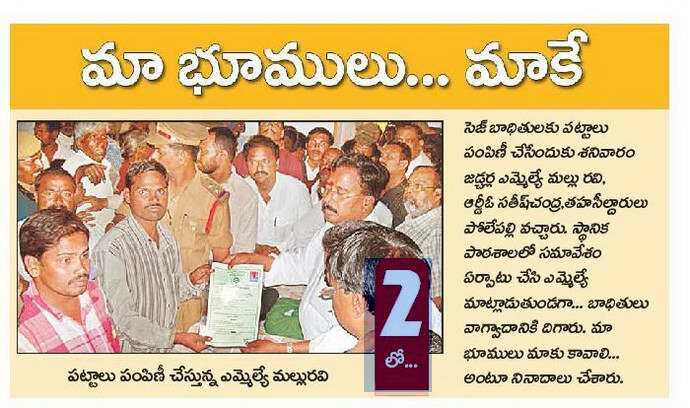 You can find here a copy of land deeds that were distributed by Jadcherla MLA Mallu Ravi, on 08th August 2008. Let us now take a moment to observe closely what these documents reveal. * We have blurred the personal information of the person with respect to their confidentiality. The documents were distributed on 9th August 2008, after the public hearing by the activists on 7th August 2008. The blacked out letters in the patta are ‘APIIC’ (not blacked out by us, but by the tahsil office before they were distributed on 08th August 2008). According to this, the land was given by APIIC, how did the Revenue Department get rights to issue the PATTAS / land deeds? I want your Land ! There are altogether 66 SEZs in AP approved so far with an area of 8020 Hectares. From the official source “Ministry of Commerce & Industry Department of Commerce” Website. What is the extent of land acquisition in other SEZs is known to the people affected in each of the 66 SEZ areas … but NOT TO REST OF US ! What Should we do?